A perfectly cooked turkey is not a difficult thing. Pick a good quality bird, keep it under 14 lbs, don’t stuff it and dry brine it. 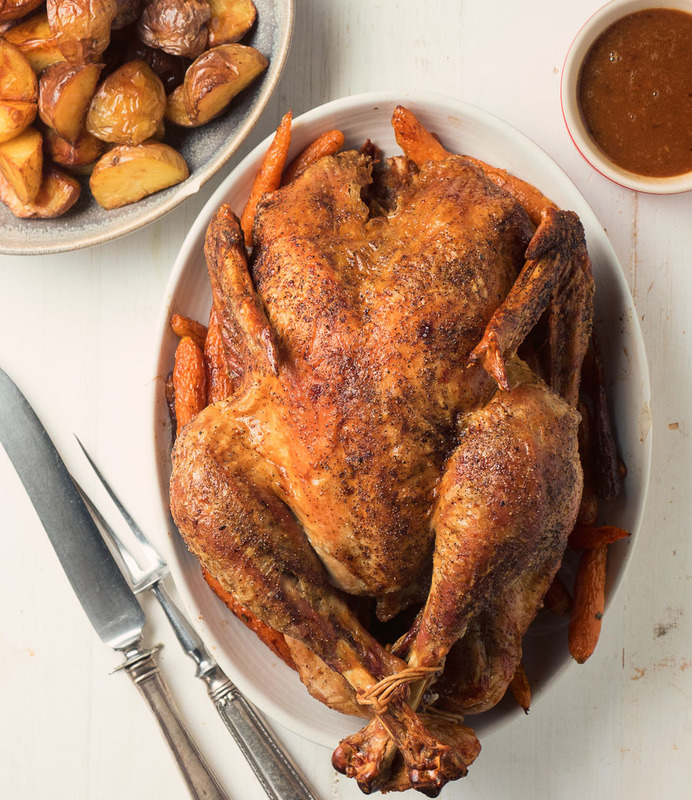 Dry brined roast turkey deserves a whole lot more attention than it gets. It works. Well. Judy Rogers of Zuni Cafe fame pioneered the dry brining technique. It’s easy. It doesn’t the take up tons of room in your fridge like wet brining and it works. It works really well. I recently saw a study that compared wet and dry brining. It was on a reputable food site so I believe the results. They had a blind taste testing. They compared wet brined, no brine and dry brined roast turkey. Dry brining won. Second went to no brine. Last place – wet brine. Last place. Crazy, messy work to make your bird worse. Dry brining is dead easy. One Tbsp of kosher salt per 5 pounds of bird. 3 days. Done. Better product. No brainer. Dry brined roast turkey for me every time. It works great for pork and poultry. 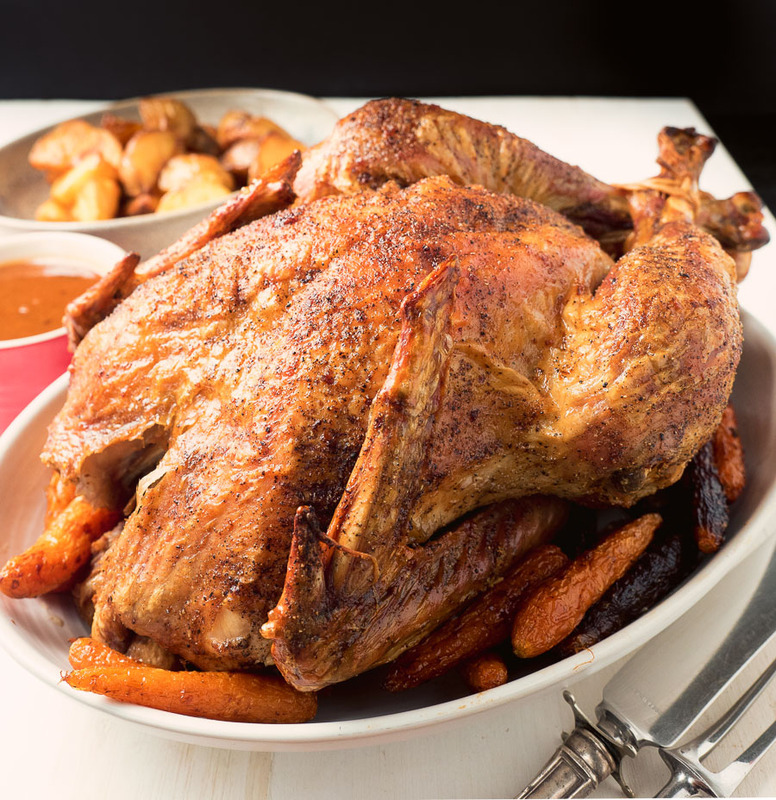 Serve it with zuni style turkey dressing and super intense gravy for a memorable holiday meal. Plan on 10-12 minutes per time roasting time to an internal temperature of 165F for the breast and 175F for the thighs. Make sure you insert the thermometer in the deepest parts of the turkey but don’t hit bone – that messes up the temperature reading. You will also need a roasting pan that can go from oven to stovetop and a v-rack (or rib rack) to keep the turkey off the bottom of your roasting pan. You definitely need an instant read thermometer for this recipe. 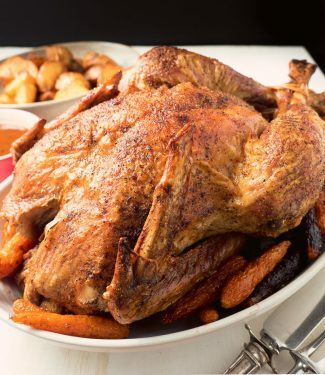 The initial breast side down roasting step protects the breast and exposes the thighs. This is the secret to an evenly cooked bird. No way to do easily flip it with a huge bird – that’s why 14 lbs is the upper limit. A good friend of mine, a fine cook himself, gave me a great tip. You can get super heavy duty dishwashing gloves for next to nothing. Slip them on and your hands are insulated. To clean them, leave them on and wash your hands as you would normally. Genius! If you aren’t going to go the distance on the super intense gravy then go with a more conventional gravy. Make it in the roasting pan while the turkey rests. Three days before turkey day sprinkle 1 Tbsp of kosher salt per 5 lbs of turkey all over the bird. Put the turkey in a plastic bag, place it on a cookie sheet and refrigerate. Turn it over every 12 hours or so. Preheat your oven to 375. While you're at it preheat your roasting pan and v-rack. Rub the turkey generously with olive oil and season with pepper. No salt required. Place the turkey on the v-rack, breast side down and place it in the oven with the legs facing the back of the oven. After 45 minutes it's time to flip the turkey breast side up. This isn't easy. Use balled up paper towel in one hand and a wooden spoon in the other and have someone around to help. Once you've made it through the flip, baste with turkey fat from the pan and return to the oven checking internal temperatures as you get close. Remove from oven and let rest 30 minutes. Spoon off all but 4-5 Tbsp turkey fat from the roasting pan being careful not to remove any of the drippings. Place the roasting pan over medium heat. Add about 3 Tbsp flour and mix thoroughly. Continue cooking for 2 minutes. You are making a roux. Next, add 1/2 cup of warm turkey stock to pan, stirring briskly. Try to dissolve as much of the brown goodness or fond on the bottom of the pan as possible. Now add another 1/2 cup and bring to a boil, stirring constantly. Add 2 cups of stock and bring to a boil. Adjust seasonings. Strain before serving. To make the best gravy you have ever made use concentrated turkey stock. It's a game changer.